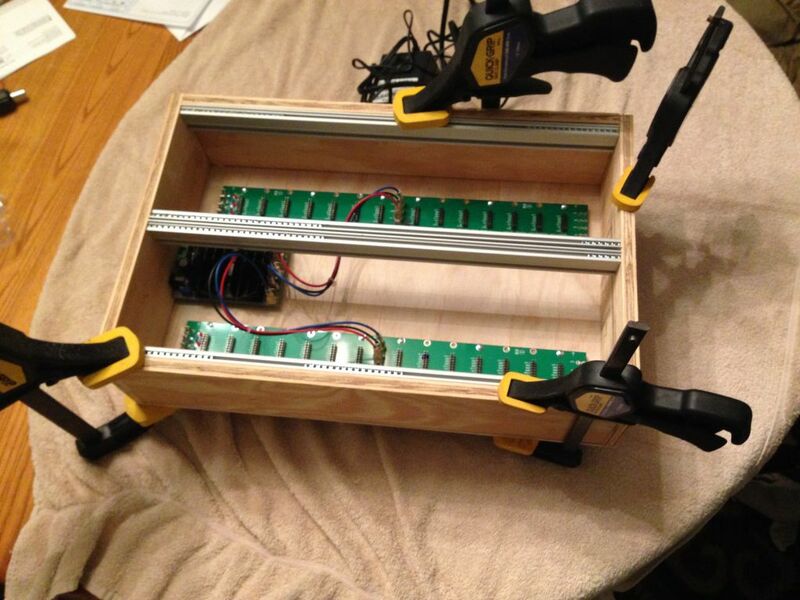 Anyone willing to share his experience with this DIY case-building kit? 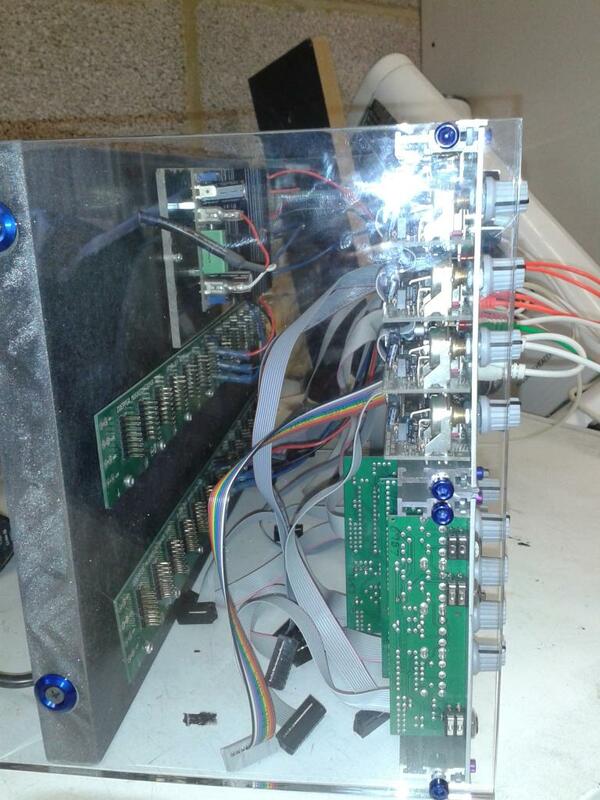 I have very litte to no knowledge of electronics but the DIY case kit seemed to be relativly easy to assemble. I'm building a ikea rast based one right now. got all parts from erthenvar which consisted of 94 hp of rails, 3u brackets. pretty straightforward. 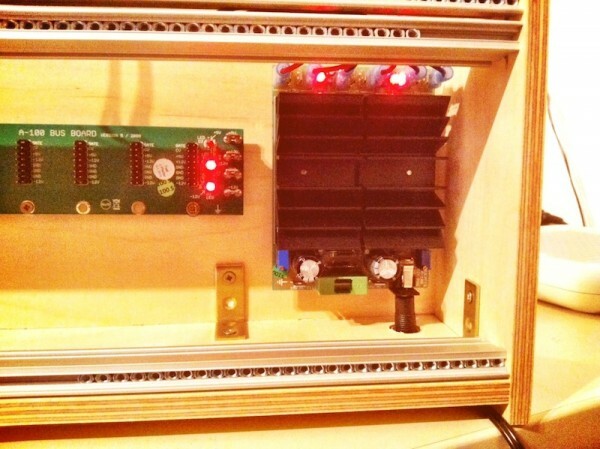 for power im using the mfos half wave board so im just running a 12v ac wallwart. ill probably go with something beefier down the road. 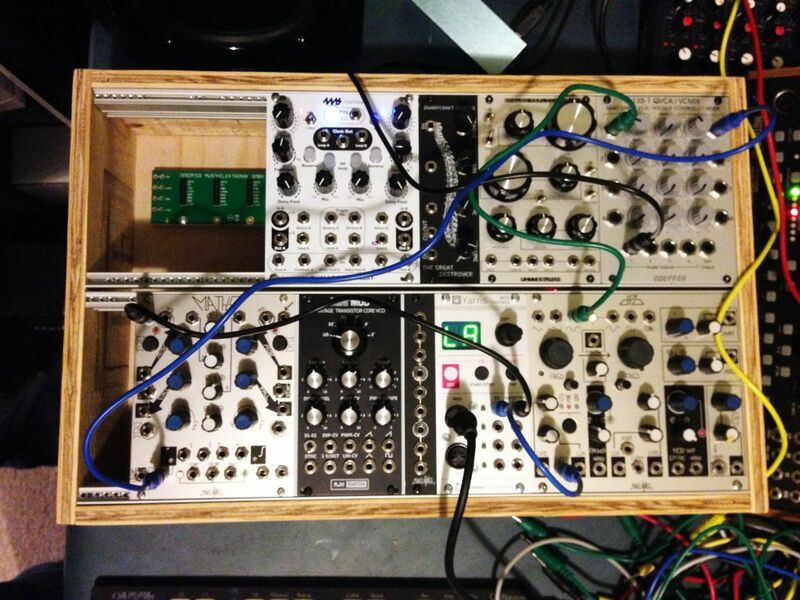 If you just buy the kit from doepfer directly, do you have all the parts needed to build the rack or are some parts still missing? 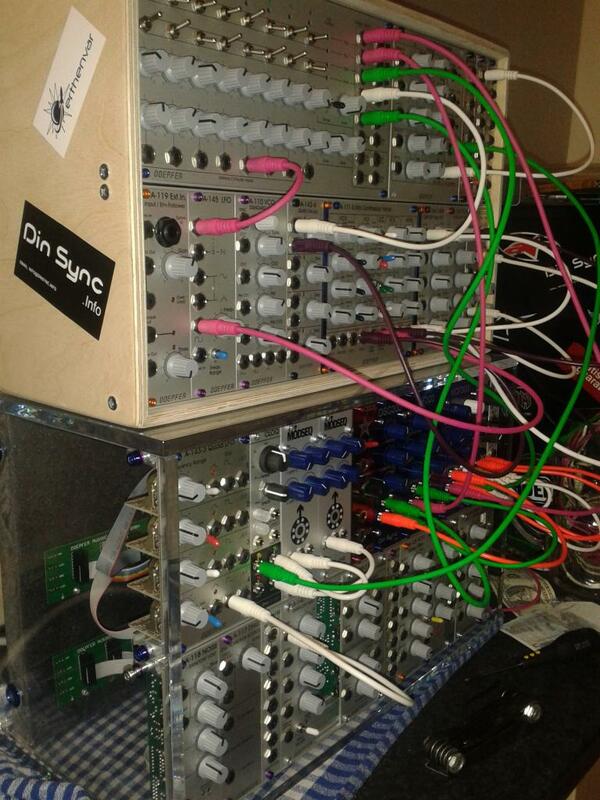 I assume you didn't buy the kit from doepfer yourself but decided to just buy all the parts individually? I was mostly worried about working with the high voltages but I presume everything is rather safe (doepfer website says : 'because of safety reasons, no dangerous voltages accessible inside the case' ) so I think there's not much to worry about? 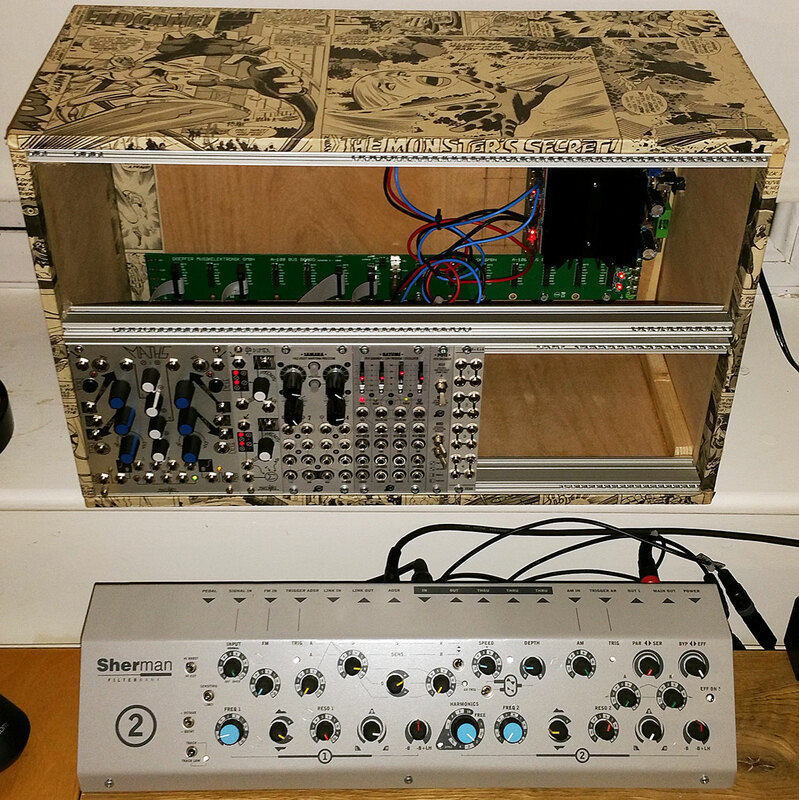 I built a case with the Doepfer DIY Kit 1 and it's super easy. You don't need any electronics knowledge, as you just have to plug a few cables onto clearly labeled pins. All you need apart from the Kit are some screws and an enclosure that you can screw everything into. You could even use a cardboard box. Cool! 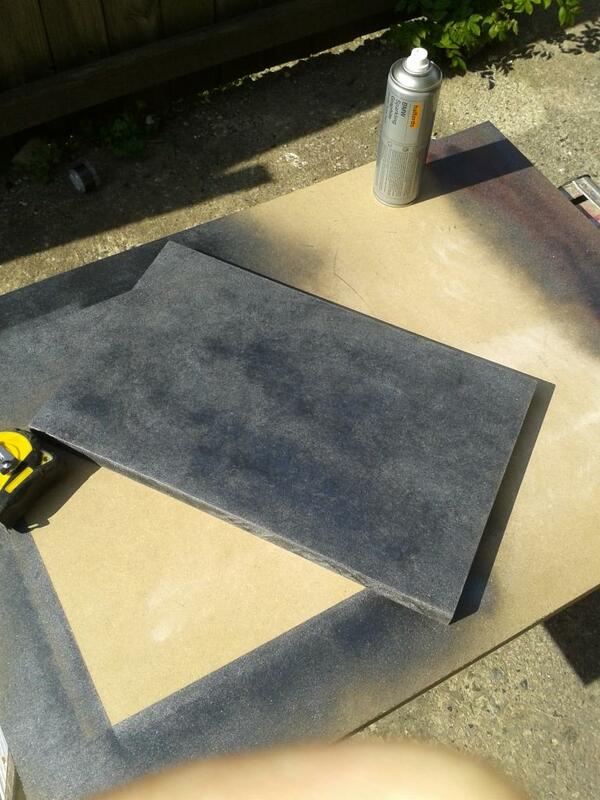 All the extra materials apart from the DIY Kit cost me just Ã¢â€šÂ¬20, so you'll definitely save a bunch of money! I went into a hardware store where they cut and sell wood, so I told them the measurements and received wood pieces that I just needed to screw together. I built my first case from a Doepfer DIY kit. It was a piece of cake. I got someone to make the wooden box (like flx did) though I could have done it myself if I had a table saw. The kit comes with a HOW TO on building a case with dimensions and everything. If you are handy at all then the DIY kit is the way to go. 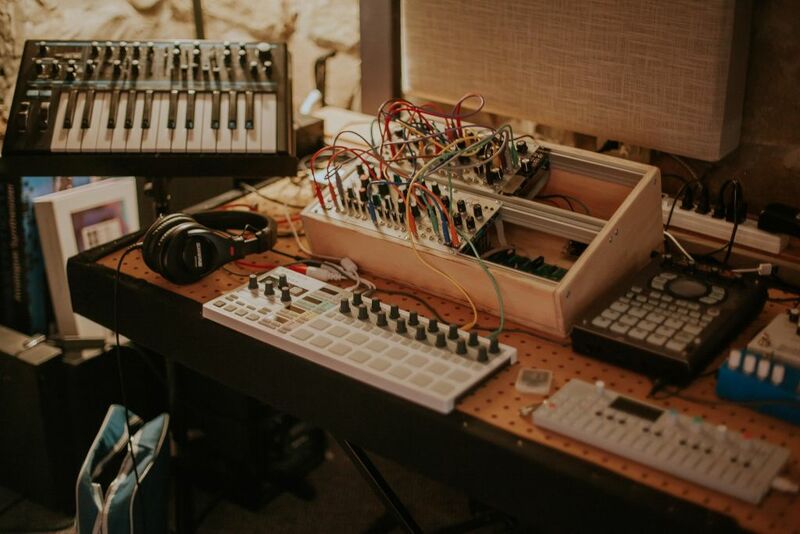 In fact the kit has one big advantage over buying Doepfer's own cases: the kit uses a mains transformer lump that lies outside the case so you can mount sensitive modules anywhere you like. 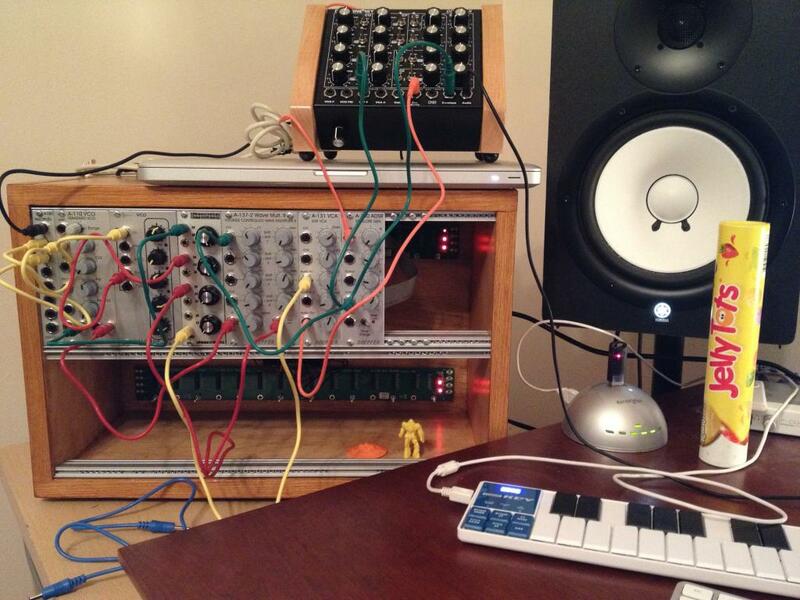 Doepfer's own cases mount the transformer inside the case, in the bottom right corner. That means you can't mount audio modules in the bottom right corner (VCO, VCF, VCA, VCP, frequency shifter, ring modulator, spring reverb and so on)! I built a a very simple 12U case around doepfer DIY kit#1 (well, actually I think I'll need a second one to put inside it). Nothing to worry about electricity-wise. 220V are safely enclosed in the external transformer, and you are exposed only to 12V. If you use this kit, where is the power switch? Do you cut a hole in the side or back of your case to mount the switch? Can this easily oower a 6U setup (two 84hp rows)? You can connect 28 modules? And each module needs its own ribbon cable to connect to the board? If you expand your system beyond 6U, do you need another whole DIY kit, need to mount another power switch, get another power cord, etc.? Or is it possible to tap additional boards into this same initial power connection? 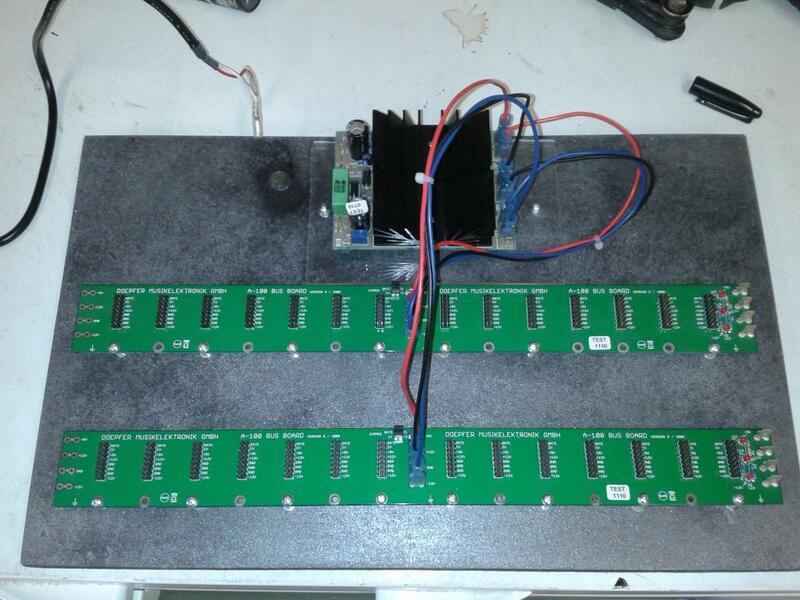 Did you guys consider any other companies' power/board solutions (tiptop, 4ms, etc.)? Are the different manufacturers' systems pretty much equivalent quality? Just resurrecting this thread to show off the case I made! I have very little experience woodworking, and this only took me a couple of hours and was a very satisfying little project. I had Lowe's cut the wood for me. Great results! And pretty cheap! I ordered the kit for $195 from Analog Haven. All wood and screws were ~$20. 1. The power supply transformer box has a switch on it (I purchased my kit Sept 2016), so you don't need to to worry about installing a separate switch if that would be important to you. 2. By putting the power supply board flush to the 1/2" plywood on the inside, I was able to drill a hole large enough for the power wire to connect easily with the power socket. It connects with a satisfying "click" and is easy to disconnect and connect. Totally solid. 3. To raise the busboards from the back panel I just glued single strips of thin wood, then screwed the boards into the strips. I ordered an A-100 DIY kit and it will arrive tomorrow. I'd like to add a set of rails to it for a total of 7u. Does anyone have some plans they can share? I'll be using standard plywood for the build. I have the A-100 kit. 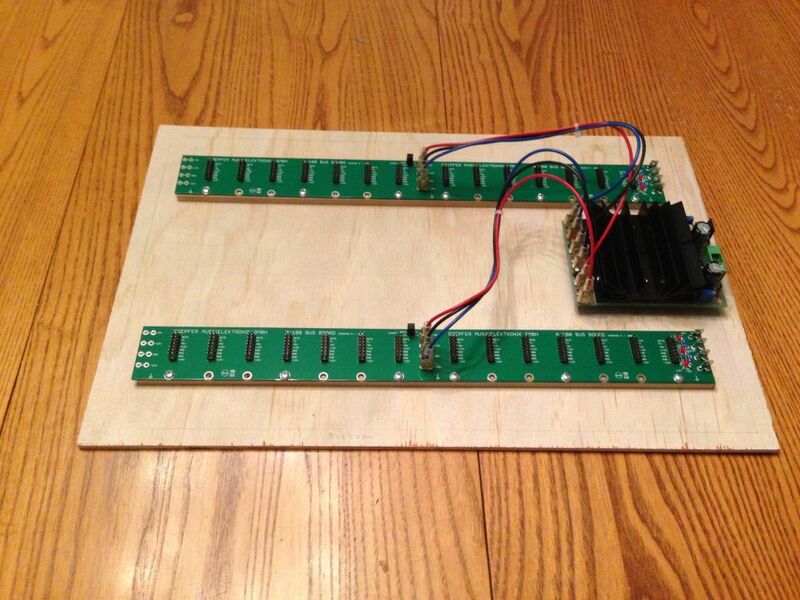 Was wondering if it's possible to add a bus board and expand it to a 9U system. I have the A-100 kit. 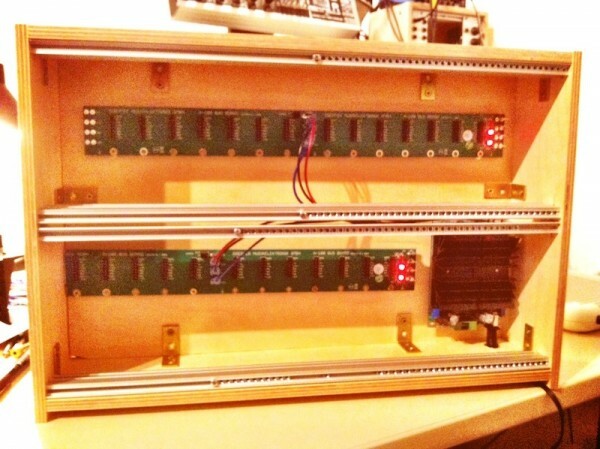 Was wondering if I can add a Bus Board and expand it to a 9U system. Thought I'd post a pic of my recently-completed project as I kept returning to this thread for inspiration/info! Everything worked out pretty much OK considering I didn't know what the hell I was doing. Mounted the power supply close to the edge as suggested so the cable can be easily unplugged. To mount the bus boards I used standard wood screws but used these little plastic covers for shed roof screws as spacers (I had a load left over from when I fixed my shed roof). This worked really well. I found the hardest thing was lining up the screws that hold the rails in place. Probably looks like a weird set of modules to kick off but I'm using this as additional modulation for other gear to start with (Mother 32, Sub 37, Tempest, Sherman). I was thinking about making a similar case, with my day, and using the DIY kit. what dimensions did you use? this is the sketch I came up with. I would appreciate your opinion/tips. thanks! 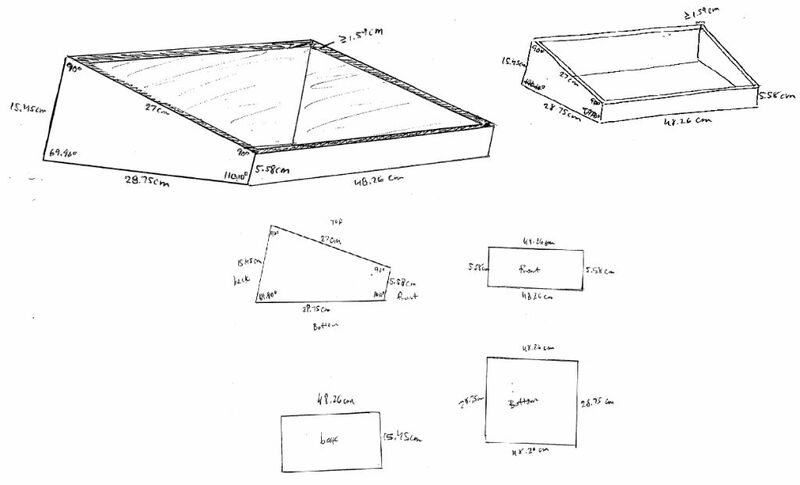 Are there templates for the a100 LCB and LC9 boxes if you want to try to make them yourself?